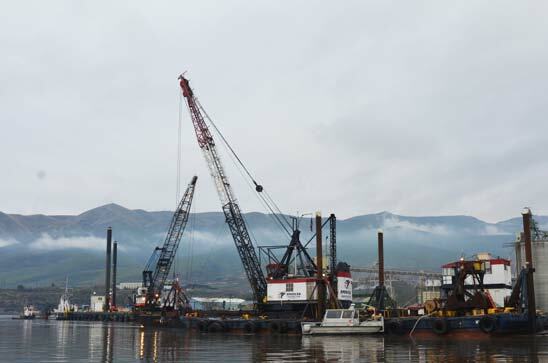 On the morning on January 12, not far from the Idaho-Washington border, a clawlike dredge descended from a crane, scooped up a wad of sediment from the bottom of the Snake River, and dumped the sludge into the bed of a waiting barge. For the first time in nine years, the U.S. Army Corps of Engineers had begun dredging the Snake -- a project the agency claims will preserve the economic viability of the river's ports, and which environmentalists say is just another harmful boondoggle on a river that's seen too many of them. For the feds, mucking out the Snake is a no-brainer. Last year, some 3 million tons of commodities -- lentils, timber, wheat and other goods -- were barged down the river. But the Snake hasn't been dredged since 2006, and sediment has built up, especially at its confluence with the Clearwater River. Though the Corps has a congressional mandate to keep the channel 14 feet deep, Port of Clarkston manager Wanda Keefer recently said it's down to 7 feet in some places, and barges have run aground. "Most navigation channels require dredging every two or three years," says Kristin Meira, executive director of the Pacific Northwest Waterways Association. "We're long overdue, and the situation has gotten pretty bad." But this is the Snake, one of the most politically fraught rivers in the country, a waterway where even seemingly routine maintenance is anything but. Though the Corps has timed its dredging to minimize harm to endangered salmon and steelhead, the nearby Nez Perce Tribe is worried about damage to another fish: Pacific lamprey, the prehistoric, eel-like creatures whose populations have been ravaged by dams. The tribe's primary concern is that dredging will wreak havoc on lamprey larvae, which bury themselves in sediment. The tribe has spent years trying to restore the species, and tribal executive committee member Dan Kane fears that dredging could undo that progress. "We've come a long way, but (lamprey) is still a very limited resource," Kane says. And while Corps studies suggest that juvenile lamprey likely aren't present in "moderate or high" numbers within the dredge site, tribal attorney Mike Lopez believes the agency's analysis was sorely inadequate. "There are lamprey above the project area, there are lamprey below the project area, and we know the habitat within the area is suitable," he says. "The reasonable conclusion is that there are lamprey within the project area." That's partly why the tribe and a coalition of environmental groups sued the Corps over its $6.7 million dredging program back in the fall. The plaintiffs also averred that the agency failed to consider other ways of dealing with the sediment problem, such as a rapid lowering of reservoirs to flush out buildup. While no one has fond memories of the disastrous 1992 drawdown that left behind "a stinky hole filled with 20 years' worth of mud and muck and trash," Earthjustice attorney Steve Mashuda points out the Corps didn't bother considering a more gradual drawdown -- or, for that matter, any other alternatives, like bendway weirs that could scour out wider channels. The Corps' failure to look at other options and economically justify the dredging, Mashuda claimed in the suit, violates the National Environmental Policy Act. At heart, the dredging dust-up is a proxy war in the decades-long fight over the four hugely controversial dams on the lower Snake River. Salmon-lovers, of course, have long targeted the dams for breaching, and have lately turned their microscope to the river's economics in an attempt to strengthen their case -- much to the chagrin of dam proponents. "This dredging project would be hailed if it were happening anywhere else in the country," says the Waterways Association's Meira. "It's coming under scrutiny simply because it's close to the dams." Yet dredging and dams go hand-in-hand: Though the four lower Snake dams do produce about 5 percent of the Northwest's power, their real reason for being is to harness the river for navigation. Whether the river's barge traffic justifies the costs of the entire infrastructural complex is a question very much in dispute. According to an analysis by Idaho resident Linwood Laughy, the Corps' shipping forecasts are consistently too high, and barge traffic is down 64 percent over the last 15 years. Inevitably, the Waterways Association fired back, commissioning its own study claiming that the reduced traffic was a product of extenuating circumstances -- lock maintenance and a global recession -- and that in-river shipping will be in greater demand as oil trains tie up the rails. Though the litigants sought an injunction to block this winter's dredging, they didn't get it, and their case against the Corps' long-term dredging program likely won't be heard until the summer. In the meantime, dredging isn't the only significant dam-related outlay on the horizon. In the coming years, turbines will have to be rehabilitated and fish passage structures demand improvement, expenditures that former Corps engineer Jim Waddell expects to run into the hundreds of millions. "We're spending far more money than we're returning in benefits," says Mashuda. "If the question was whether we'd build these dams today for navigation, the answer would be no. There's no way they'd survive the level of scrutiny they'd need to be constructed."